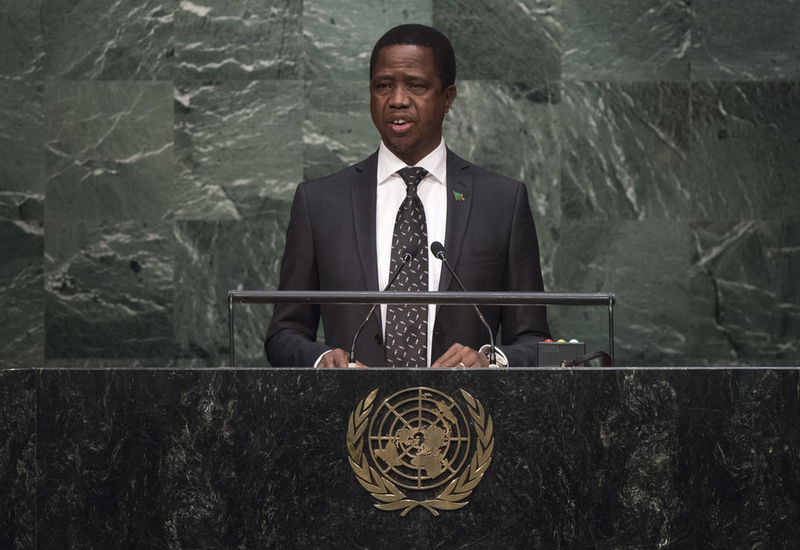 EDGAR CHAGWA LUNGU, President of Zambia, expressed optimism that the seventieth session of the Assembly would set the tone for the future and meet the expectations of the international community. However, his country was concerned that the gears to advance the three pillars of the Charter were moving at a “very slow pace”. The core elements of the 2030 Agenda, which centred on humanity, environment and peaceful societies, would guide its implementation and help to “leave no one behind”. The development lessons of the Millennium Development Goals and the cumulative experience of the United Nations should serve as a spring-board on which to spur the world’s ambitions in that arena. In the last 70 years, the inequality gap among nations had continued to widen, as poverty and youth unemployment threatened prospects for peace, security and development, he said. His Government looked towards the 2030 Agenda — which fostered poverty eradication and aimed to create employment for youth and women, especially in rural communities — to rectify those issues. While the global community was today more united on some issues, it was equally if not more divided on who should make decisions on global peace and security. There had been more conflicts in Africa over the past 70 years than on any other continent, yet there had been no move to end Africa’s “absolute exclusion” from decision-making on the Security Council. Goal 10 of the 2030 Agenda, on reducing inequality within and among countries, would not be achieved without eradicating the inequality among countries on the Security Council. Zambia had a long history of involvement in conflict prevention, peacekeeping and peacebuilding, he said. As a landlocked country, independence was incomplete as long as Zambia remained surrounded by countries still fighting liberation struggles. Zambia had been the beneficiary of various initiatives aimed at achieving the Millennium Development Goals. But many countries continued to face serious challenges in their quest for development and a better quality of life for their people. The challenges they faced were numerous, including the inseparable issues of energy shortages and climate change. This year, Zambia was experiencing an unprecedented energy crisis that had already cost the nation dearly in terms of productivity, jobs and revenue. Beyond economic limitations, the social ramifications were equally devastating; it was therefore important to exert great effort on mitigation strategies to combat climate change. Furthermore, he said, developing countries were still grappling with challenges including poverty, high unemployment, skewed industrial development, low intraregional trade and inadequate infrastructure, among others. Agriculture was one of the country’s priority areas in its efforts to diversify the economy away from mining; to that end, the country was introducing credit schemes and sought partnerships to enable the improvement of services and access to market information. On financing for developing countries in general, he stressed the need for external resources to bridge the gap required to finance development projects. The world must quickly identify sources to raise the $100 billion needed by Africa annually to finance its infrastructure development.